LITMUS TEST: Washington Falling APART! This has to be one of the most interesting starts to a calendar year we've ever seen. For one, the U.S. Federal Government, the largest institution in the world, is in a partial shutdown, the longest of its kind. It plays right into our script for 2019. This sort of behavior from politicians, which has led to 800,000 employees on the streets, unpaid, until this is resolved, resembles the rule of law in 3rd world countries, not the country, which is supposedly the beacon of light for the rest to follow. But, despite all of this, the markets have rallied up until yesterday, when they hit a brick wall. You see, now we're testing resistance, and if we can't push through, above the 2,586 levels for the S&P 500, then the bears have won. As you can see, the tax cuts have really jolted profits, artificially and in the short-term only. The rubber is about to meet the road, as banks are publishing Q4 earnings this week and in the days ahead; all U.S. corporations will as well because we're launching earnings season. While the companies that have left gold miners in the dust for 8 years are cutting profit estimates, the large-cap gold behemoths are continuing to consolidate. Newmont Mining is going to buy Goldcorp in a deal valued at $10 billion. The deal could create the largest gold miner in the world. I remember CNBC anchors holding an ounce of gold and asking Bitcoin "experts" in 2017, if gold was a relic of the past, while Bitcoin was the new form of safe haven, to which the crypto enthusiast was more than happy to share his opinion. Yet, it seems that owners of some of bitcoin's oldest accounts, those that haven't been active in a very long time, have come to life. There's a 40% increase in trading activity, in terms of wallets involved. Everybody knows Bitcoin is a tightly-held asset. About 1,000 addresses control some 85% of all Bitcoins, so there are definitely changes happening behind the scenes. THE WEALTH GAP: IT'S BEYOND BELIEF! The majority of Americans never go more than 500 miles from their hometown their entire lives. It's a shocking stat, but it shows that people are not aware of the changes that are occurring around them. 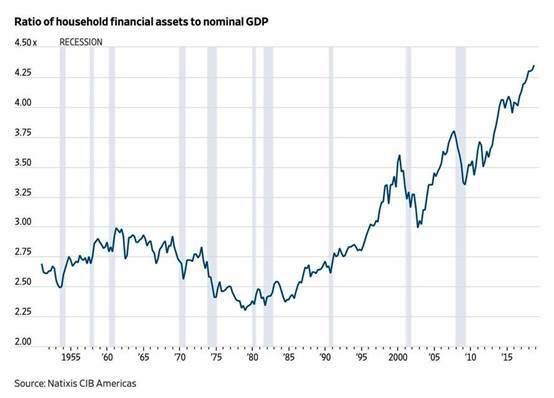 For example, the ratio of U.S. household financial assets to GDP has never been higher. In this economic expansion, in the past 10 years, unbelievable wealth has been created, yet 78% of Americans live paycheck to paycheck. This is because the system is RIGGED to benefit equity owners and punish savers and fixed-income employees. The common denominator between the citizens and the government is their addiction to debt. So, even though Americans have never been richer, as a whole, the U.S. now resembles Brazil, with its 13 controlling families, more than it resembles its old self, with its famous middle-class lifestyles. Russia is definitely the leader of it, but I must stress that in the next 10 years, both China and India will become bigger economies than the U.S., which will drop to third, followed closely by Indonesia. Japan, Germany, and other countries, which have dominated the 20th century, are flattening. There is, literally, no way in hell that the dollar leaves this period unscathed. The past 10 years have allowed our problems to linger, but the cat is out of the bag, at this point. The U.S. is plagued with internal division and is not fit to work out its complex issues, let alone lead other nations. The problem is that other countries aren't such a catch, either. Therefore, as you can see, China, along with central banks of other countries, is buying gold, hands over fist. There is no other asset, which does not attach itself to any political jurisdiction, apart from precious metals. Remember that because it is what makes them valuable.